(L-R) are: Tayeb Siad, managing director, Groupe SIAD; Steve Filipov, president — Terex Cranes; Mohammed Siad, president — Groupe SIAD; Mahmoud Siad, president — GSB France; and Daniel Patalacci, general manager South Europe — Terex Cranes. 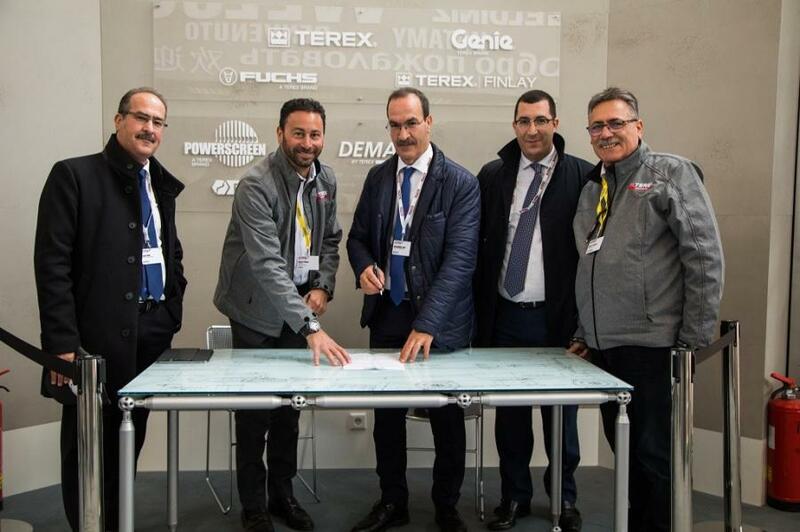 On the opening day of this year's bauma, Algerian Terex Cranes distributor ETS SIAD Automobiles (Groupe SIAD) signed an order for nine Terex rough terrain cranes. In detail, the order comprises six Terex RT 45 and three RT 45L rough terrain cranes. Both models are of the 49.6 ton (45 t) capacity class, which only differ in the length of their main jibs: While the Terex RT 45 model is equipped with a 102 ft. (31.1 m) main boom, the RT 45L model has a 122.7 ft. (37.40 m) main boom. 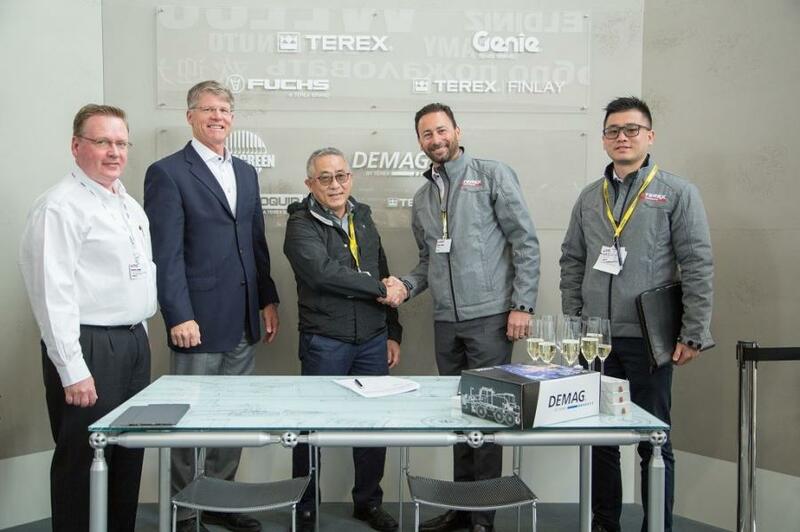 On the same day, Mobile Cranes Asia, Terex Cranes distributor in Singapore, combined its visit to the Terex stand in Munich with an order for a new Demag AC 350-6 all terrain crane. The contract was signed by Managing Director Rodney Chang, who cited the strong performance of Demag cranes in general, and the long main boom of the Demag AC 350-6, 210 ft. (64 m) in length, in particular, as decisive reasons for purchasing the crane. Together with its rated lifting capacity of up to 385.8 ton (350 t), this makes the Demag AC 350-6 one of the most versatile cranes on the market, according to the manufacturer. (L-R are): Norbert Dudek, vice president and general manager — Terex Cranes Asia; John Garrison, CEO — Terex Corporation; Rodney Chang, managing director, Mobile Cranes Asia; Steve Filipov, president — Terex Cranes; and Brad Lee, business development manager — Terex Cranes.